Kate Liston 'Feel After the New See' (2018). Photo courtesy of the artist. 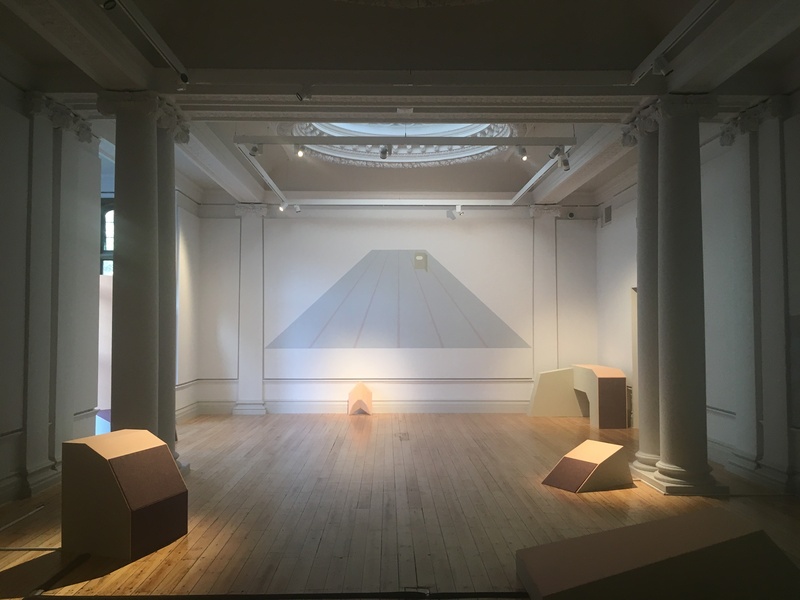 This first exhibition in a series of annual commissions from Newcastle University’s Hatton Gallery has given Kate Liston an opportunity to explore connections between the gallery’s history of supporting formal innovation and new ways of constructing aesthetic environments. Liston immerses the viewer within pastel toned block forms and shapes painted on to walls; redolent of a peaceful, futuristic retreat the exhibition invites us to imagine worlds beyond the gallery walls. Films are projected on to a painted image of a structure on the wall and there are structures (curious object-speakers) that play the musical soundtrack to the films. The projector too is housed within one of these candy coloured structures, and another has hidden within it a small bottle of scent, the kind that has the little sticks poking out. Liston has taken inspiration from a small painting by the constructivist Ella Bergmann-Michel. 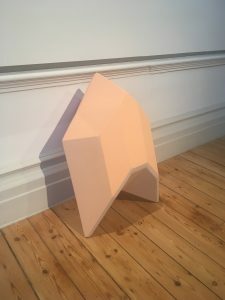 The results feel like a collaboration between the past and present and possible future of the gallery itself; an excellent response to a historic space that is associated with so much innovative 20th century art and design. 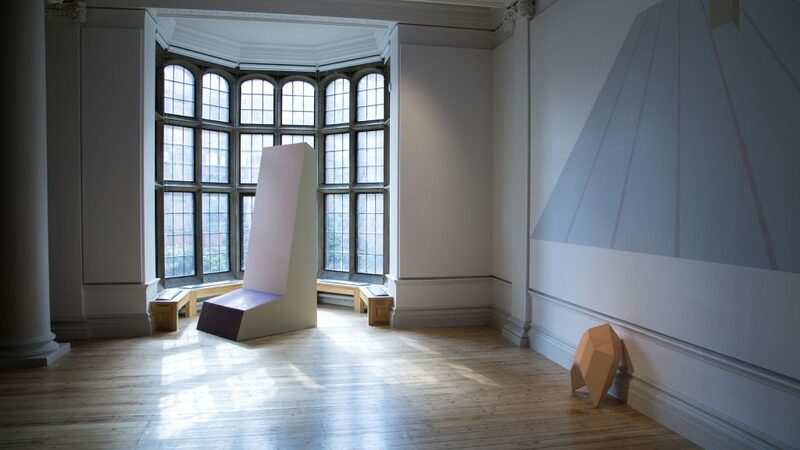 Kate Liston ‘Feel After the New See’ (2018).Photo courtesy of the artist. In the films Liston draws our attention to beauty and patterns in the arrangements around us, whether they are deemed worthy or not. The footage of the band playing in the T.V. studio has been edited into formal arrangement, we never see their faces but it could be The Animals. There are images of Newcastle: the disused public toilet in the notorious Bigg Market, dirty and decrepit, overgrown with weeds. Like the illusionistic wall paintings it extends our relation to the space beyond the gallery, out into the real world beyond the smart Newcastle University campus and into the ‘dirty old part of the city’. In another sequence a hamster and then a guinea pig navigate around miniature versions of the installation, these little animals are aesthetic test pilots feeling their way around. Various dramatic tensions are formed and released by the music (composed by Dan Wilde) which accompanies their/our investigations. Kate Liston ‘Feel After the New See’ (2018). Photo courtesy of the artist. The most prominent of the wall paintings, a large blue shape is a beautiful illusion suggestive of a field, a track or a runway out of the room into another dimension. Like the Bergmann-Michel drawing it is just shapes on a surface, but shapes that take us on a journey. The staging of artworks is under scrutiny, and in turn the way we respond to these spaces of display is too. The Bergmann-Michel drawing could easily be a diagram or map for the physical tracings that one could make through the space, around the objects. The idea of feeling one’s way round is important and the whole installation seems constructed to let you do this through sound, object and image. One feels positioned within this space – your whereabouts becomes important in relation to the ‘furniture’ and what you might do there. Feel After the New See runs until 19th May. Film for EBM will be added to the videos already in the installation in the last week of the exhibition. ‘Film for EBM’ (2018). Image courtesy of the artist. 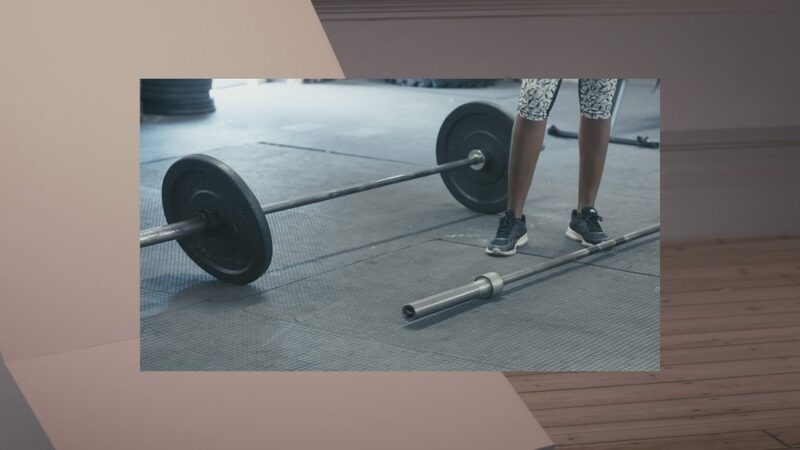 This film, produced for the end of Feel After the New See combines the actions of athletes moving in a gym with footage that captures flows of movement around the exhibition space that the film is shown within. Film for EBM has been developed throughout the exhibition and has been informed by a research visit to the Ella Bergmann Michel archive at The Sprengel Museum, Hannover; Feeling After Structure, a live action role play devised and delivered by Sarah Jury with consultation from Hamish MacPherson; and Rotation Process a film screening and performance event that explored choreographic efforts and the sense that one’s actions might be scripted by one’s environment.